Consumers' increasing desire for smartphones has been a boon for Apple as the company's share of the overall mobile phone market increased by nearly 10 percent in 2013, according to new data published Thursday. Apple accounted for 8.3 percent of the 1.8 billion handsets sold worldwide last year, up from 7.5 percent of the market in 2012, as buyers snapped up a greater number of smartphones than feature phones for the first time ever in a full year. The numbers were revealed in market research firm Gartner's final analysis of 2013. Rival Samsung —which also makes feature phones —gained 2.6 percent in the same period to finish with 24.6 percent of the market. Fellow South Korean manufacturer LG, Chinese firms Huawei, TCL, Lenovo, and Yulong, and Japanese giant Sony all posted gains between 0.3 percent and 1.6 percent though none account for more than 4 percent of the market individually. Most of the gains appear to have come at the expense of new Microsoft subsidiary Nokia, which dropped 5.2 percent year-over-year and ended 2013 with a 13.9 percent share. Chinese equipment maker ZTE was the only other company in the top 10 to shed market share, dropping 0.6 percent to 3.3 percent. 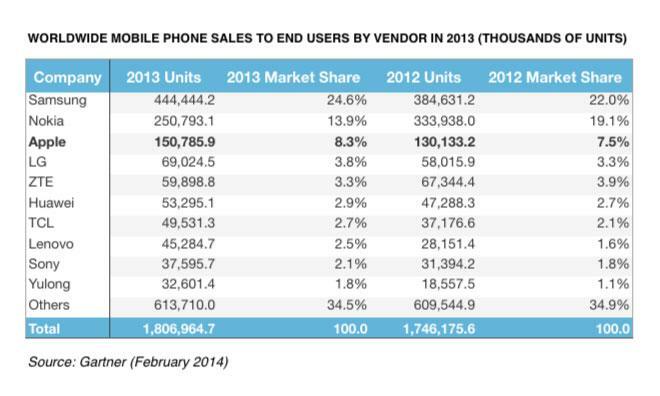 Smartphones accounted for 53.5% of the worldwide mobile phone market in 2013. While taking more of the overall mobile phone market, Cupertino, Calf.-based Apple did cede a portion of the smartphone market as the shift in buying habits increased the customer base in developing economies. Apple dropped from 19.1 percent in 2012 to 15.6 percent last year as Samsung, Huawei, LG and Lenovo all added between 0.8 percent and 1.2 percent. "With Apple adding NTT DOCOMO in Japan for the first time in September 2013 and signing a deal with China Mobile during the quarter, we are already seeing an increased growth in the Japanese market and we should see the impact of the last deal in the first quarter of 2014," said Gartner principal research analyst Anshul Gupta. Latin America led the Middle East and Africa, Asia/Pacific and Eastern Europe in smartphone sales growth for the fourth quarter of 2013, increasing by 96.1 percent. India booked the highest growth by a single nation with an explosive 166.8 percent increase, while China saw sales grow by 86.3 percent in the year. All three of the top-performing markets have been hailed as important opportunities for Apple. The company signed a landmark distribution agreement with China Mobile, the world's largest wireless carrier, at the end of last year. In addition, Apple is said to have prepared a major push into India by offering discounts and payment plans, and the company is believed to have restarted production of the low-cost iPhone 4 for India and Brazil, Latin America's largest market.